Baron Rothschild, 18th-century English nobleman and member of the great Rothschild banking family, is often credited with giving us the legendary contrarian mantra: "The time to buy is when there's blood in the streets, even if the blood is your own." The time to buy is when there's blood in the streets... But the time to sell is when there's celebration in the streets. In plain terms, Rothschild simply meant "buy the bottom." Although for him, there had been literal blood in the streets. Rothschild made a fortune after he bought into the panic that followed the Battle of Waterloo. Of course, buying the bottom doesn't work out for investors 100% of the time. For example, the guy who was the last to invest in the Pet Rock was left with a white elephant. But in general, it's best to buy the bottom. On the flip side, I seek to "sell the top" — or at least near it. Does that mean I think the equity markets have topped? No, not yet. There's no celebration in the streets just yet. The S&P 500 is edging toward 2,900. 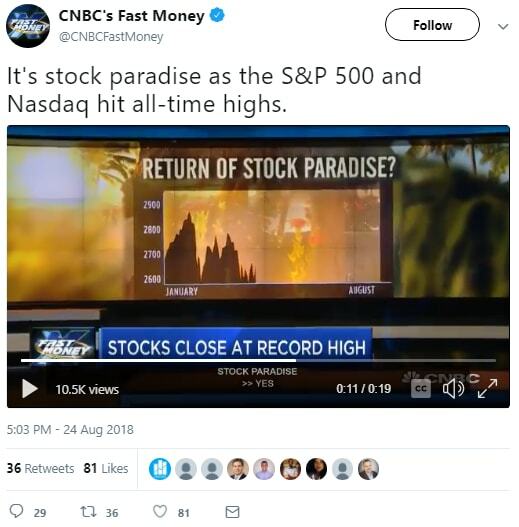 And the Nasdaq is sitting at over 8,000. Both are all-time highs. Meanwhile, the Dow is right over 26,000 and also climbing closer to breaking into new territory. Celebration naturally requires confidence. And excess celebration is a sign of overconfidence. That's dangerous waters for investors. What's more, 100% of the fund managers believed that their performance was average or better. None believed that they performed below average. You don't need to be a mathematician or statistician to figure out that this is impossible. And it shows that fund managers often display irrationally high levels of confidence. Individual investors like you and me can also be subject to overconfidence. Don't believe it can't happen to you. Right now, the U.S. markets are rallying amid a trade pact between Washington and Mexico. The Nasdaq and S&P 500 have gotten an extra push from tech and growth stocks. But the smart money is beginning to move away. Bloomberg reported this morning that short bets on Facebook, Amazon, Apple, Netflix, and Google (FAANG) stocks surged to $37 billion earlier this week. I don't think that U.S. equity markets have topped yet. But the increase in market euphoria is a sign that we should begin looking to take profits where it's appropriate.